On Väder Alarm you will find current weather data, local weather forecasts and a treasure of useful information around weather in Sweden. Thanks to our high-resolution weather radar and current severe weather warnings there will be no nasty surprise any more. Despite its location between latitudes 55°N and 70°N Sweden has a relatively temperate climate in most parts of the country. Responsible for this is the warm Gulf Stream along the Norwegian coast and the prevailing Westerlies. In the shelter of the Norwegian Alps climate is considerably drier and colder tan in Norway. Generally the country can be divided into three types of climate. Due to its nearness to the Atlantic Ocean the southern part has an oceanic climate, while the central part has a continental climate and the northernmost part has a subarctic climate. This is also the reason why 90 percent of the cultivated areas are located in the warmer south and center of Sweden. Considerable differences exist between the length of a day in winter and in summer. 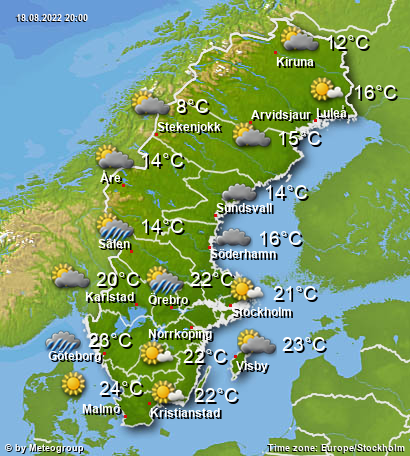 Stockholm for example has only 6 hours of sun in the winter, while in the summer even 18 hours of sunshine are possible. In the north of the country during the summer it's possible to see the midnight sun. In the northernmost city of Sweden, Kiruna, during the summer the sun is visible continuously for 50 days. Reciprocally in the winter the sun does not rise for 20 days, during the so called polar night. The temperature differences between north and south are greater in January, with an average temperature of -16 degrees in Kiruna and around 0 degrees in Malmö. During the winter it can be very cold in the whole country and temperatures around -40 degrees are not a rareness in the north. The average temperatures across the country in July are between 12 and 18 degrees, although also values around 30 degrees can be reached in the summer. The highest temperature measured so far are 38 degrees, recorded in Målilla in 1947 and in Ultuna in 1933. Precipitations occur during the whole year in Sweden, with average values between 500 and 800 l/m². The driest months are normally February and March, in opposition to July and August, when the most precipitations occur. The capital Stockholm is with 530 l/m² precipitations in a year quite dry. Generally the precipitations increase going from east towards west. Accordingly along the coasts of the Baltic Sea and of Smålands, on the isle of Öland and in some Fjällvalleys only 500 l/m² are normally accumulated during a year, in opposition to the southwest of Sweden, where in some regions of the Kattegat normal values are between 1000 to 1200 l/m². Front-runner are some regions in the mountains in the north, where even 2000 l/m² in a year are possible. The highest average values of sunshine occur also along the coast of the Baltic Sea, as well as on the isles Gotland and Öland with up to 2000 hours in a year. Also at the great lakes Vänern and Mälaren a lot of sunshine is normal, with mean 1800 hours in a year. The lowest averaged sunshine occurs in the mountains in the northwest, with only 1000 hours in a year.